Members are required to take the Advanced Training three to seven years after their initial certification. If a Rolfer elects to complete his/her Rolf Movement® Certification, then the time is extended to nine years. These requirements are in keeping with signed agreements that members have with the Rolf Institute. If there is a problem in meeting this obligation, send a letter to the Executive Director at the Rolf Institute for your situation’s review by the Board of Directors. Advanced Training is a course which is offered in various locations and formats. The Advanced Training is designed to help you develop and deepen your understanding and effectiveness as a Rolfer. It is also a context in which you can explore the latest developments in our work. A principle-centered decision making process that takes the place of all formulistic recipes(basic and advanced). A more comprehensive approach to evaluating the whole person based on our developing structural, geometrical, functional, worldview, and energetic taxonomies. A way of developing a more gentle and precise sense of touch that integrates direct/indirect and energetic techniques. A minimum of three years in Rolfing practice. 10 Required Intermediate CE Course Credits, taught by Rolf Institute approved faculty/instructors. 5 Required CE Movement Credits, taught by a Rolf Institute approved Rolf Movement faculty. Note: Any credits earned towards completion of the prerequisites for the AT program under the previous DIRI CE policy for manipulation, cranial-sacral and Rolf Movement Integration will be grandfather/mothered in and accepted as pre-requisites for the Advanced Training. While the Required Intermediate CE course credits are designed to prepare one for the Advanced Training and comply with the prerequisites for enrollment, the Required Intermediate CE courses may also be taken for elective credit as part of ongoing CE training. In order to maintain affiliation with The Rolf Institute, this course must be completed within seven years of initial Rolfing certification, or within nine years if one first completes the Rolf Movement Integration training. If an applicant has not completed the 18 CE credits required for admission to the Advanced Training they may request a waiver for the missing credits. The decision to approve or not approve is at the discretion of the Instructor. Advanced Rolfing Training is a 168 hour course, divided into 24 days that may be arranged in one of several formats. The Advanced Rolfing Certification Program is a forum for refinement and development of the work through a deeper examination of the diverse aspects of Rolfing SI, with Rolfers bringing their experiences from their private practice into the classroom setting. 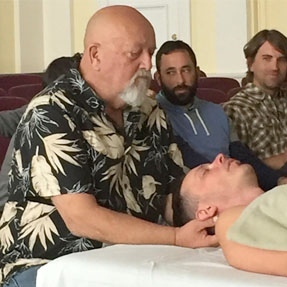 The Advanced Rolfing Certification Program provides a format for examining the energetic processes that are a fundamental part of the client-practitioner equation. Each Rolfer learns how to use these processes consciously and intentionally. The focus is on being able to meet the specific structural, functional and energetic needs of the individual client. Attention is also directed to these same aspects of the practitioner's own process. This program is designed to bring a deeper level of understanding to the Rolfer and his/her clinical practice. Please see Tuition and Costs. If you have already completed your Advanced Training through the Rolf Institute, then you are welcome to repeat the training on a space available basis (if the class is not full) at half price. If you want to be assured a spot in case the class fills, you will need to pay full price. If you are an Advanced Rolfer and would like to sit in on morning lectures only with no class participation, you will only be charged the $50 administrative fee. Instructor approval is required. Please check with the instructors in advance to determine whether space is available. We request that all visiting members recognize the priority of those completing the class for the first time.